A full Irish breakfast, or "cooked breakfast" as it was called would mainly consist of pork products as pork was the most used meat here in Ireland. This was because anyone lucky enough to have a cow would have kept her for the milk she produced which milk would have been drank and also made into butter. The cow would only produce one calf of course whereas the pig would produce a litter of piglets. Partly as a result of these factors, pork was the meat most used. The full Irish breakfast would normally have been served on a Sunday, after Mass, in later years. During the week breakfast would have been scone bread, porridge and possibly a boiled egg ~ all things more easily available to the people. On a Sunday no work was done so it was the perfect day to enjoy a "cooked breakfast". Earlier people would probably only have had this feast of a breakfast on special days and not weekly as it was from about the early middle of the last century. So probably the dish would have consisted of bacon, sausage and eggs and possibly black pudding. For our dish here we have added grilled tomatoes as they add an extra sweetness to the dish although it is highly unlikely they were available traditionally! It is also possible that the traditional full Irish breakfast would have included some potato produce such as a potato cake (mashed potato from the day before's dinner mixed with flour and an egg and made into a patty and fried). 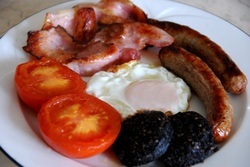 Today in Ireland a full Irish breakfast is an occasional treat given it's high calorie and fat content. It is still the breakfast of choice in many Bed & Breakfasts and hotels here although many also offer an alternaive "continental breakfast" instead ~ some even offer a vegetarian version of a Full Irish Breakfast!. The full Irish breakfast nowadays is served with many other foods including baked beans, mushrooms, hash browns and so on, none of which would have been used traditionally. The full Irish breakfast is served with brown scone bread, soda bread and/or toast, butter, and a big pot of freshly made tea. 6. When everything but the eggs are cooked, heat the smaller frying pan and add some olive oil/cooking oil. 7. Take warmed plates out of the oven and arrange sausauges, bacon, black pudding and tomatoes onto plates. 8. Fry the egg/s quickly and place on plate/s with the rest of the breakfast. 9. Enjoy with some fresh bread or toast and a pot of tea!